Do you like to travel? Maybe you’re planning your trip right now? Well, most of us love doing that once in a while, but some people just can’t stay in one place for more than a month. So as one young man from Louisiana, who got a world map tattoo on his back and every time he visited a particular country, he would then colored it on his body. This guy created a huge trend that spread all over the internet a few years ago. Since then, world map tattoos became a popular choice among many people. Apart from the obvious relation to exploration and discovery, map tattoo can also have other meanings. If you are thinking about getting it on your body, we invite you to stay with us for a while. In this article, we are going to go over the symbolism of world map tattoos and as always – we have prepared a beautiful selection of ideas. Not so long ago, when people didn’t have smartphones and Google Maps, the only navigation tool was a map and a compass. People were using them for tens of thousands of years. So, the history of maps is quite old. We can see that from the paintings in the caves that seem to resemble maps; we also have ancient maps of Greece or Asia. It’s interesting that the oldest map is not of the earth, but of the sky, and dates back to 16,500 BC. These maps are on the walls of the Lascaux caves, France. Similar sky maps that depict constellations appear in the drawings in the caves of Castle Cantabria (Spain). The oldest map of the world is the map of Babylon which is dated 600 BC. Babylonians purposely didn’t include Persia and Egypt in their clay table, and the map only represented the world of their civilization. One of the first geographers who divided the earth into five zones was Pompano Mela who lived in the Roman Empire in 43 AD. However, it was still very far from being at least somewhat similar to the modern world map. Later, in the year 1570, cartographer Abraham Ortelius published the first modern atlas which was very close to the world map we know today. – Passion for travel. Traveling is one of the main reasons why people get it. It’s a perfect way to represent your passion and to mark each country that you’ve visited. But keep in mind that you have to get a more prominent tattoo if you want to label all the countries because some of them are very tiny. Another way to express your love for travels can also be an airplane tattoo. – Open and unique personality. If you love to travel, you are probably also an open-minded person. You’re excited to meet new people, see new places, and try exotic foods. A tattoo of a world map also shows your interest in other cultures and says a lot about your personality. – Freedom and human rights. Also, a world map tattoo shows that you’re a citizen of the world. Even for those who do not travel often, a world map tattoo will remind that all humans are equal and that humanness is above the nationality. It will represent your views about the world and tell others that you are a loving and calm person. As we have gone through lots of tattoo ideas, we can say with confidence that the most favorite choice is a linear silhouette of the world map. Usually, for this tattoo girls choose their feet or wrists, while guys prefer chest, legs or shoulder blades. Although this kind of tattoo looks very simple, it requires a lot of work and experience since the silhouette must be very detailed. If you want an accurate map – remember to choose an experienced and professional tattooist. World map tattoo on the ribcage. The size of the map tattoo depends on the body part on which you want to place it. We don’t recommend getting a large piece because it will be too stretched. Ideally, it should fit on your wrist, thigh, foot, one side of the chest or one shoulder blade. The best option for a tattoo of a world map is to use a thick black line for the contours. If you are going to colorize each country after you visit it, we’d recommend using monochrome flat colors. 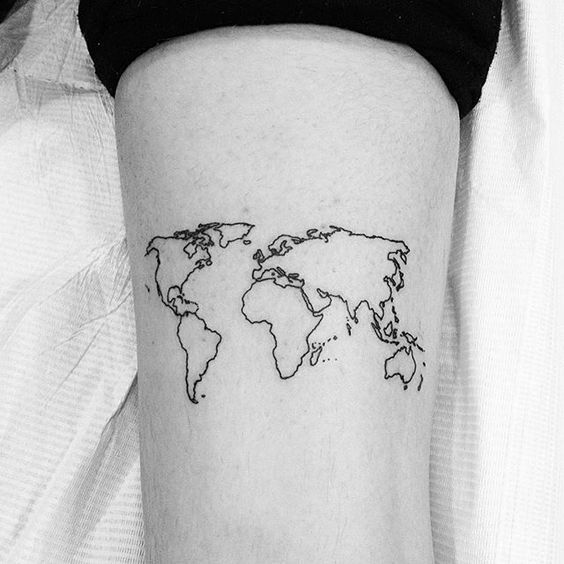 Who should get a world map tattoo? As we’ve said before, people get tats for many different reasons. And as there are various meanings of world map tattoos, so there are many reasons to get it. The first and the most obvious thing that comes in mind – traveling. If you consider yourself a traveler and enjoy being in a different country and see the world – this is a perfect choice for you. Others link their world map tattoos to the experiences or stages of life between the borders of each country. Another common reason for getting a world map tattoo is to symbolize your respect between different cultures. So, if you are a peaceful person and you truly wish the world to be a better place – this tattoo is also an excellent option for you. Whatever is your cause for a tattoo – don’t limit yourself only to these. If you don’t like the existing symbolism – create your new one! Only by creating new things and experimenting we can find new ideas. Also, if you don’t want your tattoo to mean anything – that’s completely okay. If you like the design – that’s a pretty good reason to get it. World map white tattoo on the wrist. Most of us feel sympathy or some special bond with a particular territory of our planet. If you look from a bigger perspective, you can see how insignificant our imaginable lines between the countries are. A tattoo of a world map can symbolize the importance of the unity and togetherness. It is a perfect way to show that above every nation, culture, and tradition stands a human. 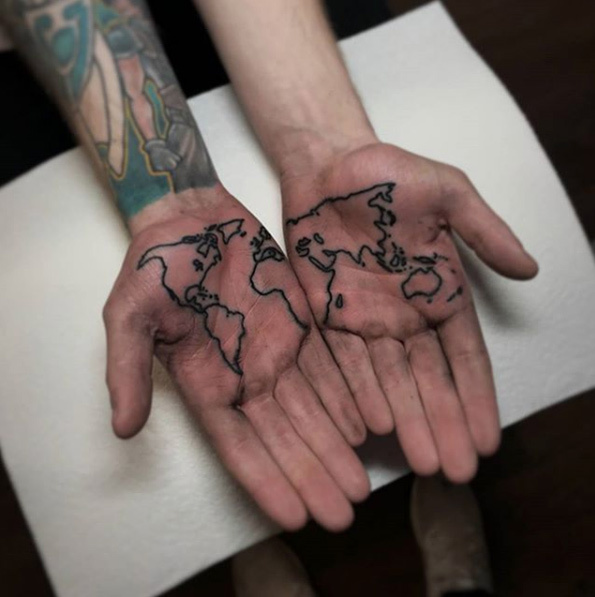 Whichever thing inspires you, make sure to check out our impressive selection of world map tattoos below!